I cannot remember the amount of core values I have rewritten for growing companies. A core value is an ethos. It is a cultural belief that is embedded in your company. It’s because of the blah factor that it has taken me a long time to come to terms with core values. I wanted to buck the system completely. Because I was so sick of the same old “value” for yet another company that looked just like the last one. Jill was an awesome speaker. She talked about her company’s values and a light bulb went off in my head. She correlated each of Oasis’ core values to how that plays out in the company. That translates to the core value: “We include everyone. Absolutely everyone.” No matter what your race, gender, religion or background says about you. That is their ethos. The cultural belief that is embedded in their company. So simple. So genius. So honest. When I worked at SkillStorm, we would hire based on character and trained for skills. We wanted people that fit with the company and we believed (and proved) that we could train people to be good at the jobs we needed them to complete. This concept works. But to take it to yet another level, what if you built your company culture around your clients? what if you built your company culture around your clients? Recently, I was listening to one of the audiobooks from our 2017 Reading Challenge. The author, Michael Schrage, suggests that the values you wish to see in your clients should be owned and planned out. Interesting concept, huh? On a basic level, that means looking at your product and service as something that creates rather than solves. One example the author uses: Steve Jobs didn’t just create computers, he created a consumer that relied on their gadgets for everyday life, people that expected sleek, beautiful computers. What both concepts have in common: they both look at how your company affects clients. Let’s look at how to use these concepts. 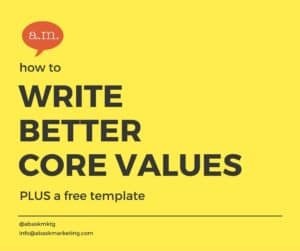 How to write your own core values. First off, you shouldn’t be writing core values unless you are either in charge of hiring, in charge of the person in charge of hiring or working directly with the person in charge of hiring. Think of your ideal client. How do you want this person to “own” your product or service? What is it that they should be saying about your company? People that buy Toms shoes, don’t really talk about the shoes, they talk about the charity. What will they say about you? 2. Think about your own values and the values that you share with your best employees. Who do you like working with? Why? Why didn’t you choose the other guy? Once you get started with these two, you will probably find more ideas popping up. Think about the vendors you work with, the hiring team, and the longest lasting employee you have. Why are they working with you? Imagine asking someone in an interview, “Why do you want to work here?” What’s the answer you want them to give? RELATED: Are You Turning Off Potential Clients with Your Elevator Pitch? How Many Core Values Should You Have? You don’t need a certain number of core values for your organization. The worst is when employees recite off ten core values, none of which mean a thing to them. One core value is fine, two is fine… have as many as you feel you need to get the point across and no more. It’s been five years since I rejected the idea of core values for Abask and I finally get the point of them. We help our clients to see new paths they may not have considered to expand their business. 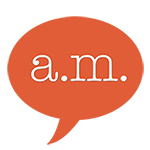 Our goal is to become an intermediary, translating what you want to sell into what your client needs to buy. We strive to make business simple. Our writing is easy to read and motivating. Our business practices are honest. We don’t forget our humble beginnings. We pay it forward through charities like Kids in Distress and by choosing to work with other small businesses whenever possible. So, that’s it. We’ve covered the wrong and right way to create core values, 2 ways to take your core values to another level, and how to create your own core values. Now, let’s get to work on yours. Use this template to create your own core values. And feel free to share them with us on our Facebook page – I would love to see how the template works out for you.